The truck covered more mileage this week than ever before! The team is on the move and nothing is slowing them down! Contrary to the usual three hour voyages, they packed in about twenty four hours of driving this week. With all those miles behind them, it would be impossible not to accumulate more memorable stories! The team got straight to business Monday morning with a Meals on Wheels donation! 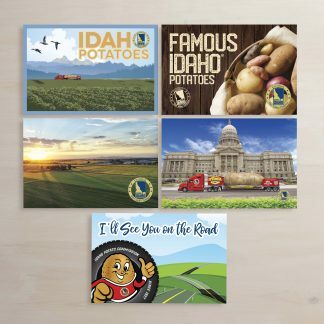 The Idaho Potato Commission graciously donated $1000 to the MOW chapter in San Antonio. Though it’s not the first donation the team has had their hand in, they are still humbled to be reminded of what a benevolent company they represent. After a busy day of prize-wheel spinning and handing out Idaho treasures, the team headed downtown to strut their stuff along the San Antonio River Walk! They were in awe as they strolled along the network of walkways that lined the cool blue San Antonio river that runs through five miles of downtown (though they didn’t walk anywhere close to the full five miles) ;). The walkways overflowed with bright flowers, shops, and restaurants. 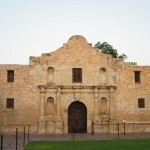 As if the river walk wasn’t enough, the trio got a blast from the past when they visited the historical Alamo! 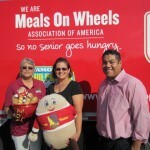 The San Antonio Meals on Wheels crew! 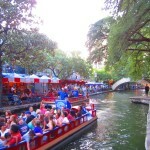 !The beautiful river walk (a.k.a the "Venice" of America)Alamooo!! Time to make like a cow-pie and hit the dusty trail!! The “A-team” started towards El Paso early Tuesday morning! While they urged the truck across the never ending black tar, hunger pains began to surface. According to the trustworthy technology of the iPhone, the team discovered there was an upcoming restaurant in the miniature town of Sheffield. The next food stop wasn’t for another eighty miles so the team decided to take the next exit and satisfy their pleading bellies at Gloria’s Kitchen! As soon as the group pulled to a stop they were the talk of the town! 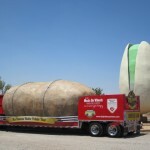 The locals were more than welcoming and were fascinated to learn all about the big spud. 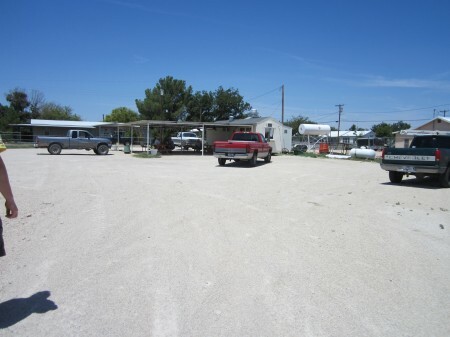 The townsmen eagerly called all their neighbors and friends to come by, and the dirt parking lot filled up in a hurry! After a long friendly visit and many pictures later, the team still had a long road ahead of them, so they hopped back in the truck and bid their farewells. 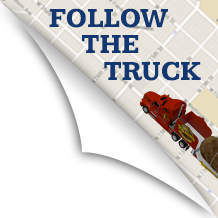 The truck spent its Wednesday afternoon at a busy Walmart in El Paso and Thursday they were off to Albuquerque! 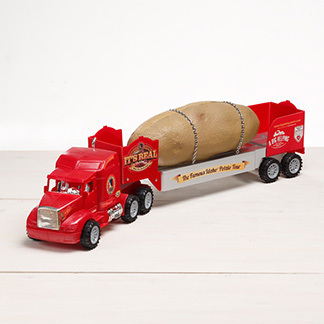 There was no way the tater team was going to drive through New Mexico without seeing the states #1 ranked attraction; the world’s biggest pistachio! Two over grown health foods..together?! How could anyone pass that up?! On top of the spectacular sight, the group got to walk onto the pistachio farm and pick their very own fresh pistachios. By the end of the visit, they had all gotten their fill of the green health nut after sampling numerous pistachio products such as pistachio brittle, pistachio ice cream, pistachio wine, and several different flavored pistachios! Kaiti’s favorite flavor was cinnamon, Ellis’s was garlic, and Paul couldn’t get enough of the brittle!! 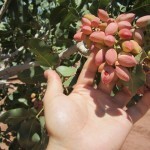 Picking pistachios! !Tater vs Nut! Dun Dun Dun! Spud vs. Nut...Dun Dun Dun!! Salted bake potato anyone? That’s what chef Fred Muller was whipping up at the FOX news station Friday morning! A perfectly baked spud coated with olive oil and sea salt, and then topped with minced onions and a squeeze of lemon. Now that will get ya’ salivating! The team wrapped up with the chef early afternoon and spent the rest of the day in the cab, trucking to Phoenix! 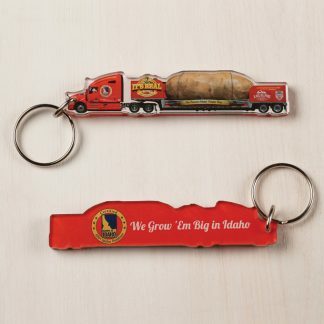 If the potato isn’t baking already, it definitely is now! Although they strategically planning methods to keep cool from the 115 degree weather, the trio is looking forward to their next sunny week in Arizona! The tater team is eager to meet all their Phoenix fans, but they need to remember one thing, don’t forget the sunscreen!! Just finished up an event, think it's hot enough? ?